"Interstate" redirects here. For the type of highway, see Controlled-access highway. For other uses, see Interstate (disambiguation). The Dwight D. Eisenhower National System of Interstate and Defense Highways, commonly known as the Interstate Highway System, is a network of controlled-access highways that forms part of the National Highway System in the United States. The system is named for President Dwight D. Eisenhower, who championed its formation. Construction was authorized by the Federal Aid Highway Act of 1956, and the original portion was completed 35 years later, although some urban routes were cancelled and never built. The network has since been extended. In 2016, it had a total length of 48,181 miles (77,540 km). As of 2016[update], about one-quarter of all vehicle miles driven in the country use the Interstate system. In 2006, the cost of construction was estimated at about $425 billion (equivalent to $521 billion in 2018). The United States government's efforts to construct a national network of highways began on an ad hoc basis with the passage of the Federal Aid Road Act of 1916, which provided for $75 million over a five-year period for matching funds to the states for the construction and improvement of highways. The nation's revenue needs associated with World War I prevented any significant implementation of this policy, which expired in 1921. In December 1918, E. J. Mehren, a civil engineer and the editor of Engineering News-Record, presented his "A Suggested National Highway Policy and Plan" during a gathering of the State Highway Officials and Highway Industries Association at the Congress Hotel in Chicago. In the plan, Mehren proposed a 50,000-mile (80,000 km) system, consisting of five east–west routes and 10 north–south routes. The system would include two percent of all roads and would pass through every state at a cost of $25,000 per mile ($16,000/km), providing commercial as well as military transport benefits. As the landmark 1916 law expired, new legislation was passed—the Federal Aid Highway Act of 1921 (Phipps Act). This new road construction initiative once again provided for federal matching funds for road construction and improvement, $75 million allocated annually. Moreover, this new legislation for the first time sought to target these funds to the construction of a national road grid of interconnected "primary highways", setting up cooperation among the various state highway planning boards. The Bureau of Public Roads asked the Army to provide a list of roads that it considered necessary for national defense. In 1922, General John J. Pershing, former head of the American Expeditionary Force in Europe during the war, complied by submitting a detailed network of 20,000 miles (32,000 km) of interconnected primary highways—the so-called Pershing Map. A boom in road construction followed throughout the decade of the 1920s, with such projects as the New York parkway system constructed as part of a new national highway system. As automobile traffic increased, planners saw a need for such an interconnected national system to supplement the existing, largely non-freeway, United States Numbered Highways system. By the late 1930s, planning had expanded to a system of new superhighways. In 1938, President Franklin D. Roosevelt gave Thomas MacDonald, chief at the Bureau of Public Roads, a hand-drawn map of the United States marked with eight superhighway corridors for study. In 1939, Bureau of Public Roads Division of Information chief Herbert S. Fairbank wrote a report called Toll Roads and Free Roads, "the first formal description of what became the interstate highway system" and, in 1944, the similarly themed Interregional Highways. The Interstate Highway System gained a champion in President Dwight D. Eisenhower, who was influenced by his experiences as a young Army officer crossing the country in the 1919 Army Convoy on the Lincoln Highway, the first road across America. Eisenhower gained an appreciation of the Reichsautobahn system, the first "national" implementation of modern Germany's Autobahn network, as a necessary component of a national defense system while he was serving as Supreme Commander Of Allied Forces in Europe during World War II. He recognized that the proposed system would also provide key ground transport routes for military supplies and troop deployments in case of an emergency or foreign invasion. The publication in 1955 of the General Location of National System of Interstate Highways, informally known as the Yellow Book, mapped out what became the Interstate Highway System. Assisting in the planning was Charles Erwin Wilson, who was still head of General Motors when President Eisenhower selected him as Secretary of Defense in January 1953. The Interstate Highway System was authorized on June 29, 1956 by the Federal Aid Highway Act of 1956, popularly known as the National Interstate and Defense Highways Act of 1956. Three states have claimed the title of first Interstate Highway. Missouri claims that the first three contracts under the new program were signed in Missouri on August 2, 1956. The first contract signed was for upgrading a section of US Route 66 to what is now designated Interstate 44. On August 13, 1956, Missouri awarded the first contract based on new Interstate Highway funding; this work began on US 40 (now I-70) in St. Charles County. Kansas claims that it was the first to start paving after the act was signed. Preliminary construction had taken place before the act was signed, and paving started September 26, 1956. The state marked its portion of I-70 as the first project in the United States completed under the provisions of the new Federal-Aid Highway Act of 1956. The Pennsylvania Turnpike could also be considered one of the first Interstate Highways. On October 1, 1940, 162 miles (261 km) of the highway now designated I‑70 and I‑76 opened between Irwin and Carlisle. The Commonwealth of Pennsylvania refers to the turnpike as the Granddaddy of the Pikes. October 17, 1974: Nebraska becomes the first state to complete all of its mainline interstate highways with the dedication of its final piece of I-80. October 12, 1979: The final section of the Canada to Mexico freeway Interstate 5 is dedicated near Stockton, California. Representatives of the two neighboring nations attended the dedication to commemorate the first contiguous freeway connecting the North American countries. August 22, 1986: The final section of the coast-to-coast I-80 (San Francisco, California, to Teaneck, New Jersey) is dedicated on the western edge of Salt Lake City, Utah, making I-80 the world's first contiguous freeway to span from the Atlantic to Pacific Ocean and, at the time, the longest contiguous freeway in the world. The section spanned from Redwood Road to just west of the Salt Lake City International Airport. At the dedication it was noted that coincidentally this was only 50 miles (80 km) from Promontory Summit, where a similar feat was accomplished 120 years prior, the laying of the golden spike of the United States' First Transcontinental Railroad. August 10, 1990: The final section of coast-to-coast I-10 (Santa Monica, California, to Jacksonville, Florida) is dedicated, the Papago Freeway Tunnel under downtown Phoenix, Arizona. Completion of this section was delayed due to a freeway revolt that forced the cancellation of an originally planned elevated routing. September 12, 1991: I-90 becomes the final coast-to-coast Interstate Highway (Seattle, Washington to Boston, Massachusetts) to be completed with the dedication of an elevated viaduct bypassing Wallace, Idaho. This section was delayed after residents forced the cancellation of the originally planned at-grade alignment that would have demolished much of downtown Wallace. The residents accomplished this feat by arranging for most of the downtown area to be declared a historic district and listed on the National Register of Historic Places; this succeeded in blocking the path of the original alignment. After the dedication residents held a mock funeral celebrating the removal of the last stoplight on a transcontinental Interstate Highway. October 14, 1992: The original Interstate Highway System is proclaimed to be complete with the opening of I-70 through Glenwood Canyon in Colorado. This section is considered an engineering marvel with a 12-mile (19 km) span featuring 40 bridges and numerous tunnels and is one of the most expensive rural highways per mile built in the United States. Although this was claimed the final section of Interstate Highway to open, at the time this section was dedicated there were still missing interchanges elsewhere in the system, making some Interstate Highways not contiguous. The initial cost estimate for the system was $25 billion over 12 years; it ended up costing $114 billion (adjusted for inflation, $425 billion in 2006 dollars) and took 35 years. The system was proclaimed complete in 1992, but two of the original interstates—I-95 and I-70—were not continuous: both of these discontinuities were due to local opposition, which blocked efforts to build the necessary connections to fully complete the system. I-95 was made a continuous freeway in 2018,  and thus I-70 remains the only original interstate with a discontinuity. I-95 was discontinuous in New Jersey because of the cancellation of the Somerset Freeway. This situation was remedied when the construction of the Pennsylvania Turnpike/Interstate 95 Interchange Project started in 2010 and partially opened on September 22, 2018, which was already enough to fill the gap. However, I-70 remains discontinuous in Pennsylvania, because of the lack of a direct interchange with the Pennsylvania Turnpike at the eastern end of the concurrency near Breezewood. Traveling in either direction, I-70 traffic must exit the freeway and use a short stretch of US-30 (which includes a number of roadside services) to rejoin I-70. The interchange was not originally built because of a legacy federal funding rule, since relaxed, which restricted the use of federal funds to improve roads financed with tolls. Solutions have been proposed to eliminate the discontinuity, but they have been blocked by local opposition, fearing a loss of business. The Interstate Highway System has been expanded numerous times. The expansions have both created new designations and extended existing designations. For example, I-49, added to the system in the 1980s as a freeway in Louisiana, was designated as an expansion corridor, and FHWA approved the expanded route north from Lafayette, to Kansas City, Missouri. The freeway exists today as separate completed segments, with segments under construction or in the planning phase between them. In 1966, the FHWA designated the entire Interstate Highway System as part of the larger Pan-American Highway System, and at least two proposed Interstate expansions were initiated to help trade with Canada and Mexico spurred by the North American Free Trade Agreement (NAFTA). Long-term plans for I-69, which currently exists in several separate completed segments (the largest of which are in Indiana and Texas), is to have the highway route extend from Tamaulipas, Mexico to Ontario, Canada. The planned I-11 will then bridge the Interstate gap between Phoenix, Arizona and Las Vegas, Nevada, and thus form part of the CANAMEX Corridor (along with I-19, and portions of I-10 and I-15) between Sonora, Mexico and Alberta, Canada. I-40 in Memphis, Tennessee was rerouted and part of the original I-40 is still in use as the eastern half of Sam Cooper Boulevard. I-66 in the District of Columbia was abandoned in 1977. I-69 was to continue past its terminus at Interstate 465 to intersect with Interstate 70 and Interstate 65 at the north split, northeast of downtown Indianapolis. Though local opposition led to the cancellation of this project in 1981, bridges and ramps for the connection into the "north split" remain visible. I-70 in Baltimore was supposed to run from the Baltimore Beltway (Interstate 695), which surrounds the city to terminate at I-95, the East Coast thoroughfare that runs through Maryland and Baltimore on a diagonal course, northeast to southwest; the connection was cancelled on the mid-1970s due to its routing through Gwynns Falls-Leakin Park, a wilderness urban park reserve following the Gwynns Falls stream through West Baltimore. This included the cancellation of I-170, partially built and in use as U.S. Route 40, and nicknamed the Highway to Nowhere. I-78 in New York City was canceled along with portions with I-278, I-478, and I-878. I-878 was supposed to be part of I-78, and I-478 and I-278 were to be spur routes. I-80 in San Francisco was originally planned to travel past the city's Civic Center along the Panhandle Freeway into Golden Gate Park and terminate at the original alignment of I-280/SR 1. The city canceled this and several other freeways in 1958. Similarly, more than 20 years later, Sacramento canceled plans to upgrade I-80 to Interstate Standards and rerouted the freeway on what was then I-880 that traveled north of Downtown Sacramento. I-83, southern extension of the Jones Falls Expressway (southern I-83) in Baltimore was supposed run along the waterfront of the Patapsco River / Baltimore Harbor to connect to I-95, bisecting historic neighborhoods of Fells Point and Canton, but the connection was never built. I-95 through the District of Columbia into Maryland was abandoned in 1977. Instead it was rerouted to I-495 (Capital Beltway). The completed section is now I-395. I-95 was originally planned to run up the Southwest Expressway and meet I-93, where the two highways would travel along the Central Artery through downtown Boston, but was rerouted onto the Route 128 beltway due to widespread opposition. This revolt also included the cancellation of the Inner Belt, connecting I-93 to I-90 and a cancelled section of the Northwest Expressway which would have carried Route 3 inside the Route 128 beltway, meeting with Route 2 in Cambridge. The American Association of State Highway and Transportation Officials (AASHTO) has defined a set of standards that all new Interstates must meet unless a waiver from the Federal Highway Administration (FHWA) is obtained. One almost absolute standard is the controlled access nature of the roads. With few exceptions, traffic lights (and cross traffic in general) are limited to toll booths and ramp meters (metered flow control for lane merging during rush hour). Being freeways, Interstate Highways usually have the highest speed limits in a given area. Speed limits are determined by individual states. From 1974 to 1986, the maximum speed limit on any highway in the United States was 55 miles per hour (90 km/h), in accordance with federal law. Typically, lower limits are established in Northeastern and coastal states, while higher speed limits are established in inland states west of the Mississippi River. For example, the maximum speed limit is 75 mph (120 km/h) in northern Maine, varies between 50 and 70 mph (80 and 115 km/h) from southern Maine to New Jersey, and is 50 mph (80 km/h) in New York City and the District of Columbia. Currently, rural speed limits elsewhere generally range from 65 to 80 miles per hour (105 to 130 km/h). Several portions of various highways such as I-10 and I-20 in rural western Texas, I-80 in Nevada between Fernley and Winnemuca (except around Lovelock) and portions of I-15, I-70, I-80, and I-84 in Utah have a speed limit of 80 mph (130 km/h). Other interstate highways in Idaho, Montana, South Dakota and Wyoming also have the same high speed limits. In some areas, speed limits on Interstates can be significantly lower in areas where they traverse significantly hazardous areas. The maximum speed limit on I-90 is 50 mph (80 km/h) in downtown Cleveland because of two sharp curves with a suggested limit of 35 mph (55 km/h) in a heavily congested area; I-70 through Wheeling, West Virginia, has a maximum speed limit of 45 mph (70 km/h) through the Wheeling Tunnel and most of downtown Wheeling; and I-68 has a maximum speed limit of 40 mph (65 km/h) through Cumberland, Maryland, because of multiple hazards including sharp curves and narrow lanes through the city. In some locations, low speed limits are the result of lawsuits and resident demands; after holding up the completion of I-35E in St. Paul, Minnesota, for nearly 30 years in the courts, residents along the stretch of the freeway from the southern city limit to downtown successfully lobbied for a 45 mph (70 km/h) speed limit in addition to a prohibition on any vehicle weighing more than 9,000 pounds (4,100 kg) gross vehicle weight. I-93 in Franconia Notch State Park in northern New Hampshire has a speed limit of 45 mph (70 km/h) because it is a parkway that consists of only one lane per side of the highway. On the other hand, Interstates 15, 80 and 84 in Utah have speed limits as high as 70 mph (115 km/h) within the Salt Lake City, Cedar City, and St. George areas, and I-25 in New Mexico within the Santa Fe and Las Vegas areas along with I-20 in Texas along Odessa and Midland and I-29 in North Dakota along the Grand Forks area have higher speed limits of 75 mph (120 km/h). As one of the components of the National Highway System, Interstate Highways improve the mobility of military troops to and from airports, seaports, rail terminals, and other military bases. 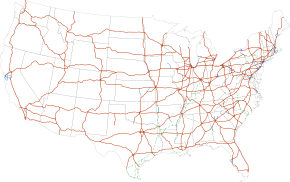 Interstate Highways also connect to other roads that are a part of the Strategic Highway Network, a system of roads identified as critical to the U.S. Department of Defense. The system has also been used to facilitate evacuations in the face of hurricanes and other natural disasters. An option for maximizing traffic throughput on a highway is to reverse the flow of traffic on one side of a divider so that all lanes become outbound lanes. This procedure, known as contraflow lane reversal, has been employed several times for hurricane evacuations. After public outcry regarding the inefficiency of evacuating from southern Louisiana prior to Hurricane Georges' landfall in September 1998, government officials looked towards contraflow to improve evacuation times. In Savannah, Georgia, and Charleston, South Carolina, in 1999, lanes of I-16 and I-26 were used in a contraflow configuration in anticipation of Hurricane Floyd with mixed results. In 2004 contraflow was employed ahead of Hurricane Charley in the Tampa, Florida area and on the Gulf Coast before the landfall of Hurricane Ivan; however, evacuation times there were no better than previous evacuation operations. Engineers began to apply lessons learned from the analysis of prior contraflow operations, including limiting exits, removing troopers (to keep traffic flowing instead of having drivers stop for directions), and improving the dissemination of public information. As a result, the 2005 evacuation of New Orleans, Louisiana, prior to Hurricane Katrina ran much more smoothly. According to urban legend, early regulations required that one out of every five miles of the Interstate Highway System must be built straight and flat, so as to be usable by aircraft during times of war. There is no evidence of this rule being included in any Interstate legislation. Odd numbers run north–south with numbers increasing from west to east, while even numbers run east–west with numbers increasing from south to north. The numbering scheme for the Interstate Highway System was developed in 1957 by the American Association of State Highway and Transportation Officials (AASHTO). The association's present numbering policy dates back to August 10, 1973. Within the continental United States, primary Interstates—also called main line Interstates or two-digit Interstates—are assigned numbers less than 100. While numerous exceptions do exist, there is a general scheme for numbering Interstates. Primary Interstates are assigned one- or two-digit numbers, while shorter routes (such as spurs, loops, and short connecting roads) are assigned three-digit numbers where the last two digits match the parent route (thus, I-294 is a loop that connects at both ends to I-94, while I-787 is a short spur route attached to I-87). In the numbering scheme for the primary routes, east–west highways are assigned even numbers and north–south highways are assigned odd numbers. Odd route numbers increase from west to east, and even-numbered routes increase from south to north (to avoid confusion with the U.S. Highways, which increase from east to west and north to south). This numbering system usually holds true even if the local direction of the route does not match the compass directions. Numbers divisible by five are intended to be major arteries among the primary routes, carrying traffic long distances. Primary north–south Interstates increase in number from I-5 between Canada and Mexico along the West Coast to I‑95 between Canada and Miami, Florida along the East Coast. Major west–east arterial Interstates increase in number from I-10 between Santa Monica, California, and Jacksonville, Florida, to I-90 between Seattle, Washington, and Boston, Massachusetts, with two exceptions. There are no I-50 and I-60, as routes with those numbers would likely pass through states that currently have U.S. Highways with the same numbers, which is generally disallowed under highway administration guidelines. Several two-digit numbers are shared between road segments at opposite ends of the country for various reasons. Some such highways are incomplete Interstates (such as I-69 and I-74) and some just happen to share route designations (such as I-76, I-84, I‑86, I-87, and I-88). Some of these were due to a change in the numbering system as a result of a new policy adopted in 1973. Previously, letter-suffixed numbers were used for long spurs off primary routes; for example, western I‑84 was I‑80N, as it went north from I‑80. The new policy stated, "No new divided numbers (such as I-35W and I-35E, etc.) shall be adopted." The new policy also recommended that existing divided numbers be eliminated as quickly as possible; however, an I-35W and I-35E still exist in the Dallas–Fort Worth metroplex in Texas, and an I-35W and I-35E that run through Minneapolis and Saint Paul, Minnesota, still exist. Additionally, due to Congressional requirements, three sections of I-69 in southern Texas will be divided into I-69W, I-69E, and I-69C (for Central). AASHTO policy allows dual numbering to provide continuity between major control points. This is referred to as a concurrency or overlap. For example, I‑75 and I‑85 share the same roadway in Atlanta; this 7.4-mile (11.9 km) section, called the Downtown Connector, is labeled both I‑75 and I‑85. Concurrencies between Interstate and U.S. Route numbers are also allowed in accordance with AASHTO policy, as long as the length of the concurrency is reasonable. In rare instances, two highway designations sharing the same roadway are signed as traveling in opposite directions; one such wrong-way concurrency is found between Wytheville and Fort Chiswell, Virginia, where I‑81 north and I‑77 south are equivalent (with that section of road traveling almost due east), as are I‑81 south and I‑77 north. Examples of the auxiliary Interstate Highway numbering system. An odd hundreds digit means the route connects at only one end to the rest of the interstate system, known as a "spur route". An even hundreds digit means the route connects at both ends, which could be a loop route (which has two termini) or a radial route (known also as a beltway, beltline, or circumferential route). Auxiliary Interstate Highways are circumferential, radial, or spur highways that principally serve urban areas. These types of Interstate Highways are given three-digit route numbers, which consist of a single digit prefixed to the two-digit number of its parent Interstate Highway. Spur routes deviate from their parent and do not return; these are given an odd first digit. Circumferential and radial loop routes return to the parent, and are given an even first digit. Unlike primary Interstates, three-digit Interstates are signed as either east–west or north–south, depending on the general orientation of the route, without regard to the route number. For instance, I-190 in Massachusetts is labeled north–south, while I-195 in New Jersey is labeled east–west. Some looped Interstate routes use inner–outer directions instead of compass directions, when the use of compass directions would create ambiguity. Due to the large number of these routes, auxiliary route numbers may be repeated in different states along the mainline. Some auxiliary highways do not follow these guidelines, however. The Interstate Highway System also extends to Alaska, Hawaii, and Puerto Rico, even though they have no direct land connections to any other states or territories. However, their residents still pay federal fuel and tire taxes. The Interstates in Hawaii, all located on the most populous island of Oahu, carry the prefix H. There are three one-digit routes in the state (H-1, H-2, and H-3) and one auxiliary route (H-201). These Interstates connect several military and naval bases together, as well as the important cities and towns spread across Oahu, and especially the metropolis of Honolulu. Both Alaska and Puerto Rico also have public highways that receive 90 percent of their funding from the Interstate Highway program. The Interstates of Alaska and Puerto Rico are numbered sequentially in order of funding without regard to the rules on odd and even numbers. They also carry the prefixes A and PR, respectively. However, these highways are signed according to their local designations, not their Interstate Highway numbers. Furthermore, these routes were neither planned according to nor constructed to the official Interstate Highway standards. On one- or two-digit Interstates, the mile marker numbering almost always begins at the southern or western state line. If an Interstate originates within a state, the numbering begins from the location where the road begins in the south or west. As with all guidelines for Interstate routes, however, numerous exceptions exist. Three-digit Interstates with an even first number that form a complete circumferential (circle) bypass around a city feature mile markers that are numbered in a clockwise direction, beginning just west of an Interstate that bisects the circumferential route near a south polar location. In other words, mile marker 1 on I-465, a 53-mile (85 km) route around Indianapolis, is just west of its junction with I-65 on the south side of Indianapolis (on the south leg of I-465), and mile marker 53 is just east of this same junction. An exception is I-495 in the Washington metropolitan area, with mileposts increasing counterclockwise because part of that road is also part of I-95. The exit numbers of interchanges are either sequential or distance-based so that the exit number is the same as the nearest mile marker. Under the latter system, a single mile with multiple exits may be assigned letter suffixes, for example on I‑890 in New York. AASHTO defines a category of special routes separate from primary and auxiliary Interstate designations. These routes do not have to comply to Interstate construction or limited-access standards but are routes that may be identified and approved by the association. The same route marking policy applies to both US Numbered Highways and Interstate Highways; however, business route designations are sometimes used for Interstate Highways. Known as Business Loops and Business Spurs, these routes principally travel through the corporate limits of a city, passing through the central business district when the regular route is directed around the city. They also use a green shield instead of the red and blue shield. Interstate highways and their rights of way are owned by the state in which they were built. The last federally owned portion of the Interstate System was the Woodrow Wilson Bridge on the Washington Capital Beltway. The new bridge was completed in 2009 and is collectively owned by Virginia and Maryland. Maintenance is generally the responsibility of the state department of transportation. However, there are some segments of Interstate owned and maintained by local authorities. About 70 percent of the construction and maintenance costs of Interstate Highways in the United States have been paid through user fees, primarily the fuel taxes collected by the federal, state, and local governments. To a much lesser extent they have been paid for by tolls collected on toll highways and bridges. The Highway Trust Fund, established by the Highway Revenue Act in 1956, prescribed a three-cent-per-gallon fuel tax, soon increased to 4.5 cents per gallon. Since 1993 the tax has remained at 18.4 cents per gallon. The rest of the costs of these highways are borne by general fund receipts, bond issues, designated property taxes, and other taxes. The federal contribution comes overwhelmingly from motor vehicle and fuel taxes (93.5 percent in 2007), as does about 60 percent of the state contribution. However, any local government contributions are overwhelmingly from sources besides user fees. The portion of the user fees spent on highways themselves covers about 57 percent of their costs, with about one-sixth of the user fees being sent to other programs, including the mass transit systems in large cities. Some large sections of Interstate Highways that were planned or constructed before 1956 are still operated as toll roads. Others have had their construction bonds paid off and they have become toll-free, such as in Connecticut (I‑95), Maryland (I‑95), Virginia (I‑95), and Kentucky (I‑65). As American suburbs have expanded, the costs incurred in maintaining freeway infrastructure have also grown, leaving little in the way of funds for new Interstate construction. This has led to the proliferation of toll roads (turnpikes) as the new method of building limited-access highways in suburban areas. Some Interstates are privately maintained (for example, the VMS company maintains I‑35 in Texas) to meet rising costs of maintenance and allow state departments of transportation to focus on serving the fastest-growing regions in their states. Parts of the Interstate System might have to be tolled in the future to meet maintenance and expansion demands, as has been done with adding toll HOV/HOT lanes in cities such as Atlanta, Dallas, and Los Angeles. Although part of the tolling is an effect of the SAFETEA‑LU act, which has put an emphasis on toll roads as a means to reduce congestion, present federal law does not allow for a state to change a freeway section to a tolled section for all traffic. See also: Category:Tolled sections of Interstate Highways. About 2,900 miles (4,700 km) of toll roads are included in the Interstate Highway System. While federal legislation initially banned the collection of tolls on Interstates, many of the toll roads on the system were either completed or under construction when the Interstate Highway System was established. Since these highways provided logical connections to other parts of the system, they were designated as Interstate highways. Congress also decided that it was too costly to either build toll-free Interstates parallel to these toll roads, or directly repay all the bondholders who financed these facilities and remove the tolls. Thus, these toll roads were grandfathered into the Interstate Highway System. Toll roads designated as Interstate highways (such as the Massachusetts Turnpike) were typically allowed to continue collecting tolls, but are generally ineligible to receive federal funds for maintenance and improvements. Some toll roads that did receive federal funds to finance emergency repairs (notably the Connecticut Turnpike (I-95) following the Mianus River Bridge collapse) were required to remove tolls as soon as the highway's construction bonds were paid off. In addition, these toll facilities were grandfathered from Interstate Highway standards. A notable example is the western approach to the Benjamin Franklin Bridge in Philadelphia, where I-676 has a surface street section through a historic area. Policies on toll facilities and Interstate Highways have since changed. The Federal Highway Administration has allowed some states to collect tolls on existing Interstate Highways, while a recent extension of I-376 included a section of Pennsylvania Route 60 that was tolled by the Pennsylvania Turnpike Commission before receiving Interstate designation. Also, newer toll facilities (like the tolled section of I-376, which was built in the early 1990s) must conform to Interstate standards. A new addition of the Manual on Uniform Traffic Control Devices in 2009 requires a black-on-yellow "Toll" sign to be placed above the Interstate trailblazer on Interstate Highways that collect tolls. Legislation passed in 2005 known as SAFETEA-LU, encouraged states to construct new Interstate Highways through "innovative financing" methods. SAFETEA-LU facilitated states to pursue innovative financing by easing the restrictions on building interstates as toll roads, either through state agencies or through public–private partnerships. However, SAFETEA-LU left in place a prohibition of installing tolls on existing toll-free Interstates, and states wishing to toll such routes to finance upgrades and repairs must first seek approval from Congress. Interstate Highways financed with federal funds are known as "chargeable" Interstate routes, and are considered part of the 42,000-mile (68,000 km) network of highways. Federal laws also allow "non-chargeable" Interstate routes, highways funded similarly to state and U.S. Highways to be signed as Interstates, if they both meet the Interstate Highway standards and are logical additions or connections to the system. These additions fall under two categories: routes that already meet Interstate standards, and routes not yet upgraded to Interstate standards. Only routes that meet Interstate standards may be signed as Interstates once their proposed number is approved. Interstate Highways are signed by a number placed on a trademarked red, white, and blue sign. The colors red, white, and blue were chosen because they are the colors of the American flag. In the original design, the name of the state was displayed above the highway number, but in many states, this area is now left blank, allowing for the printing of larger and more-legible digits. The sign usually measures 36 inches (91 cm) high, and is 36 inches (91 cm) wide for two-digit Interstates or 45 inches (110 cm) for three-digit Interstates. Interstate business loops and spurs use a special shield in which the red and blue are replaced with green, the word "BUSINESS" appears instead of "INTERSTATE", and the word "SPUR" or "LOOP" usually appears above the number. The green shield is employed to mark the main route through a city's central business district, which intersects the associated Interstate highway at one (spur) or both (loop) ends of the business route. The route usually traverses the main thoroughfare(s) of the city's downtown area or other major business district. A city may have more than one Interstate-derived business route, depending on the number of Interstates passing through a city and the number of significant business districts therein. Over time, the design of the Interstate shield has changed. In 1957 the Interstate shield designed by Texas Highway Department employee Richard Oliver was introduced, the winner of a contest that included 100 entries; at the time, the shield color was a dark navy blue and only 17 inches (43 cm) wide. The Manual on Uniform Traffic Control Devices (MUTCD) standards revised the shield in the 1961, 1971, and 1978 editions. The majority of Interstates have exit numbers. All traffic signs and lane markings on the Interstates are supposed to be designed in compliance with the Manual on Uniform Traffic Control Devices (MUTCD). There are, however, many local and regional variations in signage. For many years, California was the only state that did not use an exit numbering system. It was granted an exemption in the 1950s due to having an already largely completed and signed highway system; placing exit number signage across the state was deemed too expensive. To control costs, California began to incorporate exit numbers on its freeways in 2002—Interstate, U.S., and state routes alike. Caltrans commonly installs exit number signage only when a freeway or interchange is built, reconstructed, retrofitted, or repaired, and it is usually tacked onto the top-right corner of an already existing sign. Newer signs along the freeways follow this practice as well. Most exits along California's Interstates now have exit number signage, particularly in rural areas. California, however, still does not use mileposts, although a few exist for experiments or for special purposes. Exit numbers correspond to Interstate mileage markers in most states. On I‑19 in Arizona, however, length is measured in kilometers instead of miles because, at the time of construction, a push for the United States to change to a metric system of measurement had gained enough traction that it was mistakenly assumed that all highway measurements would eventually be changed to metric; proximity to metric-using Mexico may also have been a factor, as I‑19 indirectly connects I‑10 to the Mexican Federal Highway system via surface streets in Nogales. Mileage count increases from west to east on most even-numbered Interstates; on odd-numbered Interstates mileage count increases from south to north. Some highways, including the New York State Thruway, use sequential exit-numbering schemes. Exits on the New York State Thruway count up from Yonkers traveling north, and then west from Albany. As of November 2010[update], the Illinois State Toll Highway Authority has redone the mileage markers to be uniform with the rest of the state on I‑90 (Jane Addams Memorial/Northwest Tollway) and the I‑94 section of the Tri‑State Tollway, which previously had matched the I‑294 section starting in the south at I‑80/I‑94/IL Route 394. The tollway also added exit number tabs to the exits. Many northeastern states label exit numbers sequentially, regardless of how many miles have passed between exits. States in which Interstate exits are still numbered sequentially are Connecticut, Delaware, Massachusetts, New Hampshire, New York, Rhode Island, and Vermont; as such, five of the main Interstate highways that remain completely within these states (87, 88, 89, 91, and 93) have interchanges numbered sequentially along their entire routes. Maine, Pennsylvania, Virginia, Georgia, and Florida followed this system for a number of years, but since converted to mileage-based exit numbers. Georgia renumbered in 2000, while Maine did so in 2004. The Pennsylvania Turnpike uses both mile marker numbers and sequential numbers. Mile marker numbers are used for signage, while sequential numbers are used for numbering interchanges internally. The New Jersey Turnpike, including the portions that are signed as I‑95 and I‑78, also has sequential numbering, but other Interstates within New Jersey use mile markers. I‑87 in New York State is numbered in three sections. The first section makes up the Major Deegan Expressway in the Bronx, with interchanges numbered sequentially from 1 to 14. The second section of I‑87 is a part of the New York State Thruway that starts in Yonkers (exit 1) and continues north to Albany (exit 24); at Albany, the Thruway turns west and becomes I‑90 for exits 25 to 61. From Albany north to the Canadian border, the exits on I‑87 are numbered sequentially from 1 to 44 along the Adirondack Northway. This often leads to confusion as there is more than one exit on I‑87 with the same number. For example, exit 4 on Thruway section of I‑87 connects with the Cross County Parkway in Yonkers, but exit 4 on the Northway is the exit for the Albany airport. These two exits share a number but are located 150 miles (240 km) apart. Heaviest traveled: 374,000 vehicles per day: I-405 in Los Angeles, California (2008 estimate). Highest: 11,158 feet (3,401 m): I-70 in the Eisenhower Tunnel at the Continental Divide in the Colorado Rocky Mountains. Lowest (land): −52 feet (−16 m): I-8 at the New River near Seeley, California. Lowest (underwater): −103 feet (−31 m): I-95 in the Fort McHenry Tunnel under the Baltimore Inner Harbor. Longest (east–west): 3,020.54 miles (4,861.09 km): I-90 from Boston, Massachusetts, to Seattle, Washington. Shortest (two-digit): 1.69 mi (2.72 km): I-69W in Laredo, Texas. Longest segment between state lines: 881 mi (1,418 km): I-10 in Texas from the New Mexico state line near El Paso to the Louisiana state line near Orange, Texas. Shortest segment between state lines: 453 ft (138 m): Interstate 95/I-495 (Capital Beltway) on the Woodrow Wilson Bridge across the Potomac River where they briefly cross the southernmost tip of the District of Columbia between its borders with Maryland and Virginia. Longest concurrency: 278.4 mi (448.0 km): I-80 and I-90; Gary, Indiana, to Elyria, Ohio. Most states served by an Interstate: 15 states plus the District of Columbia: I-95 through Florida, Georgia, South Carolina, North Carolina, Virginia, DC, Maryland, Delaware, Pennsylvania, New Jersey, New York, Connecticut, Rhode Island, Massachusetts, New Hampshire, and Maine. Most Interstate mileage in a state: 3,233.45 mi (5,203.73 km): Texas, in 17 different routes. ^ Weingroff, Richard F. (Summer 1996). "Federal-Aid Highway Act of 1956, Creating the Interstate System". Public Roads. 60 (1). ISSN 0033-3735. Retrieved March 16, 2012. ^ a b Office of Highway Policy Information (September 18, 2017). Table HM-20: Public Road Length, 2016, Miles By Functional System (Report). Federal Highway Administration. Retrieved May 11, 2018. ^ Office of Highway Policy Information (December 2017). Table VM-1: Annual Vehicle Distance Traveled in Miles and Related Data, 2016, by Highway Category and Vehicle Type (Report). Federal Highway Administration. Retrieved May 11, 2018. ^ a b Neuharth, Al (June 22, 2006). "Traveling Interstates is our Sixth Freedom". USA Today. Retrieved May 9, 2012. ^ Thomas, Ryland & Williamson, Samuel H. (2019). "What Was the U.S. GDP Then?". MeasuringWorth. Retrieved April 6, 2019. United States Gross Domestic Product deflator figures follow the Measuring Worth series. ^ Schwantes (2003), p. 142. ^ a b Mehren, E.J. (December 19, 1918). "A Suggested National Highway Policy and Plan". Engineering News-Record. 81 (25): 1112–1117. ISSN 0891-9526. Retrieved August 17, 2015 – via Google Books. ^ Weingroff, Richard (October 15, 2013). "'Clearly Vicious as a Matter of Policy': The Fight Against Federal-Aid". Federal Highway Administration. Retrieved August 17, 2015. ^ a b Schwantes (2003), p. 152. ^ McNichol (2006), p. 87. ^ Schwantes (2003), p. 153. ^ McNichol (2006), p. 78. ^ Weingroff, Richard F. (Summer 1996). "The Federal-State Partnership at Work: The Concept Man". Public Roads. 60 (1). ISSN 0033-3735. Retrieved March 16, 2012. ^ Petroski, Henry (2006). "On the Road". American Scientist. 94 (5): 396–9. doi:10.1511/2006.61.396. ISSN 0003-0996. ^ Norton, Peter (1996). "Fighting Traffic: U.S. Transportation Policy and Urban Congestion, 1955–1970". Essays in History. Corcoran Department of History at the University of Virginia. Archived from the original on February 15, 2008. Retrieved January 17, 2008. ^ a b c Weingroff, Richard F. (Summer 1996). "Three States Claim First Interstate Highway". Public Roads. 60 (1). ISSN 0033-3735. Retrieved February 16, 2008. ^ Nebraska Department of Roads (n.d.). "I-80 50th Anniversary Page". Nebraska Department of Roads. Retrieved August 23, 2009. ^ California Department of Transportation (n.d.). "Timeline of Notable Events of the Interstate Highway System in California". California Department of Transportation. Retrieved March 2, 2014. 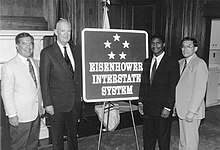 ^ "America Celebrates 30th Anniversary of the Interstate System". U.S. Highways. Fall 1986. Retrieved March 10, 2012. ^ "Around the Nation: Transcontinental Road Completed in Utah". The New York Times. August 25, 1986. ^ Utah Transportation Commission (1983). Official Highway Map (Map). Utah Department of Transportation. Salt Lake City inset. ^ a b Weingroff, Richard F. (January 2006). "The Year of the Interstate". Public Roads. 69 (4). ISSN 0033-3735. ^ Idaho Transportation Department (May 31, 2006). "Celebrating 50 years of Idaho's Interstates". Idaho Transportation Department. Archived from the original on February 24, 2012. Retrieved March 10, 2012. ^ Colorado Department of Transportation (n.d.). "CDOT Fun Facts". Colorado Department of Transportation. Archived from the original on January 16, 2008. Retrieved February 15, 2008. ^ Stufflebeam Row, Karen; LaDow, Eva & Moler, Steve (March 2004). "Glenwood Canyon 12 Years Later". Federal Highway Administration. ^ Minnesota Department of Transportation (2006). "Mn/DOT Celebrates Interstate Highway System's 50th Anniversary". Minnesota Department of Transportation. Archived from the original on December 4, 2007. Retrieved January 17, 2008. ^ a b c Sofield, Tom (September 22, 2018). "Decades in the Making, I-95, Turnpike Connector Opens to Motorists". Levittown Now. Retrieved September 22, 2018. ^ Pennsylvania Turnpike Commission (n.d.). "Draft: Design Advisory Committee Meeting No. 2" (PDF). I-95/I-276 Interchange Project Meeting Design Management Summary. Pennsylvania Turnpike Commission. ^ Federal Highway Administration (n.d.). "Why Does The Interstate System Include Toll Facilities?". Federal Highway Administration. Retrieved July 15, 2009. ^ Tuna, Gary (July 27, 1989). "Dawida seeks to merge I-70, turnpike at Breezewood". Pittsburgh Post-Gazette – via Google News. ^ Missouri Department of Transportation (n.d.). "Converting US Route 71 to I-49". Interstate I-49 Expansion Corridor in Southwest District of Missouri. Missouri Department of Transportation. Archived from the original on January 17, 2013. ^ New Mexico State Highway and Transportation Department (2007). State of New Mexico Memorial Designations and Dedications of Highways, Structures and Buildings (PDF). Santa Fe: New Mexico State Highway and Transportation Department. p. 14. Archived from the original (PDF) on July 16, 2011. ^ McNichol (2006), pp. 159–160. ^ "Nixon Approves Limit of 55 M.P.H." The New York Times. January 3, 1974. pp. 1, 24. Archived from the original on June 5, 2011. Retrieved July 27, 2008. (Subscription required (help)). ^ a b Carr, John (October 11, 2007). "State traffic and speed laws". Massachusetts Institute of Technology. Retrieved January 10, 2008. ^ Koenig, Paul (May 27, 2014). "Speed Limit on Much of I-295 Rises to 70 MPH". Portland Press Herald. Retrieved July 22, 2014. ^ Slater, Rodney E. (Spring 1996). "The National Highway System: A Commitment to America's Future". Public Roads. 59 (4). ISSN 0033-3735. Retrieved January 10, 2008. ^ Wolshon, Brian (August 2001). ""One-Way-Out": Contraflow Freeway Operation for Hurricane Evacuation" (PDF). National Hazards Review. 2 (3): 105–12. doi:10.1061/(ASCE)1527-6988(2001)2:3(105). Archived from the original (PDF) on October 6, 2008. Retrieved January 10, 2008. ^ Faquir, Tahira (March 30, 2006). "Contraflow Implementation Experiences in the Southern Coastal States" (PDF). Florida Department of Transportation. Archived from the original (PDF) on October 25, 2007. Retrieved September 27, 2007. ^ McNichol, Dan (December 2006). "Contra Productive". Roads & Bridges. Archived from the original on July 15, 2011. Retrieved January 10, 2008. ^ Mikkelson, Barbara (April 1, 2011). "Interstate Highways as Airstrips". Snopes. Retrieved March 15, 2017. ^ Weingroff, Richard F. (May–June 2000). "One Mile in Five: Debunking the Myth". Public Roads. 63 (6). ISSN 0033-3735. Retrieved December 14, 2010. ^ a b c d e f American Association of State Highway and Transportation Officials (January 2000). "Establishment of a Marking System of the Routes Comprising the National System of Interstate and Defense Highways" (PDF). American Association of State Highway and Transportation Officials. Archived from the original (PDF) on November 1, 2006. Retrieved January 23, 2008. ^ Fausset, Richard (November 13, 2001). "Highway Numerology Muddled by Potholes in Logic". Los Angeles Times. p. B2. Retrieved September 8, 2018. ^ McNichol (2006), p. 172. ^ Weingroff, Richard F. (January 18, 2005). "Was I-76 Numbered to Honor Philadelphia for Independence Day, 1776?". Ask the Rambler. Federal Highway Administration. Retrieved January 17, 2008. ^ Federal Highway Administration (n.d.). "Interstate FAQ". Federal Highway Administration. Retrieved June 26, 2009. Proposed I-41 in Wisconsin and partly completed I-74 in North Carolina respectively are possible and current exceptions not adhering to the guideline. It is not known if the U.S. Highways with the same numbers will be retained in the states upon completion of the Interstate routes. ^ Essex, Allen (May 2013). "State adds I-69 to Interstate System". The Brownsville Herald. Retrieved July 17, 2013. ^ Federal Highway Administration (March 22, 2007). "FHWA Route Log and Finder List". Federal Highway Administration. Retrieved January 23, 2008. ^ a b DeSimone, Tony (March 22, 2007). "FHWA Route Log and Finder List: Additional Designations". Federal Highway Administration. Retrieved January 4, 2010. ^ Indiana Department of Transportation (n.d.). "Understanding Interstate Route Numbering, Mile Markers & Exit Numbering". Indiana Department of Transportation. Retrieved November 26, 2011. ^ a b American Association of State Highway and Transportation Officials (January 2000). "Establishment and Development of United States Numbered Highways" (PDF). American Association of State Highway and Transportation Officials. Archived from the original (PDF) on November 1, 2006. Retrieved January 23, 2008. ^ Federal Highway Administration (n.d.). "Interstate FAQ: Who owns it?". Federal Highway Administration. ^ Weingroff, Richard M. (April 7, 2011). "When did the Federal Government begin collecting the gas tax?". Ask the Rambler. Federal Highway Administration. Retrieved June 29, 2011. ^ Federal Highway Administration (January 3, 2012). "Funding For Highways and Disposition of Highway-User Revenues, All Units of Government, 2007". Highway Statistics 2007. Federal Highway Administration. Retrieved March 10, 2012. ^ Field, David (July 29, 1996). "On 40th birthday, Interstates Face Expensive Midlife Crisis". Insight on the News. pp. 40–42. ISSN 1051-4880. ^ VMS, Inc. (n.d.). "Projects by Type: Interstates". VMS, Inc. Archived from the original on September 22, 2007. Retrieved January 10, 2008. ^ Hart, Ariel (July 19, 2007). "1st Toll Project Proposed for I-20 East: Plan Would Add Lanes Outside I-285" (PDF). The Atlanta Journal-Constitution. ISSN 1539-7459. Archived from the original (PDF) on October 25, 2007. Retrieved September 27, 2007. ^ VanMeter, Darryl D. (October 28, 2005). "Future of HOV in Atlanta" (PDF). American Society of Highway Engineers. Archived from the original (PDF) on October 25, 2007. Retrieved September 27, 2007. ^ Weiss, Martin H. (April 7, 2011). "How Many Interstate Programs Were There?". Highway History. Federal Highway Administration. Retrieved March 10, 2012. ^ Weingroff, Richard F. (August 2, 2011). "Why Does The Interstate System Include Toll Facilities?". Ask the Rambler. Federal Highway Administration. Retrieved March 10, 2012. ^ Federal Highway Administration (November 16, 2011). "Interim Releases for New and Revised Signs". Standard Highway Signs and Markings. Federal Highway Administration. Retrieved March 10, 2012. ^ 23 U.S.C. § 103(c), Interstate System. ^ American Association of State Highway Officials (September 19, 1967). "Trademark Registration 0835635". Trademark Electronic Search System. U.S. Patent and Trademark Office. Retrieved April 27, 2014. ^ a b Federal Highway Administration (May 10, 2005) . "Guide Signs" (PDF). Standard Highway Signs (2004 English ed.). Washington, DC: Federal Highway Administration. pp. 3-1 to 3-3. OCLC 69678912. Retrieved February 22, 2012. ^ Federal Highway Administration (December 2009). "Chapter 2D. Guide Signs: Conventional Roads" (PDF). Manual on Uniform Traffic Control Devices (2009 ed.). Washington, DC: Federal Highway Administration. p. 142. OCLC 496147812. ^ Michigan Department of Transportation (2011). Pure Michigan: State Transportation Map (Map). c. 1:221,760. Lansing: Michigan Department of Transportation. Lansing inset. OCLC 42778335, 786008212. ^ Texas Transportation Institute (2005). "Ties to Texas" (PDF). Texas Transportation Researcher. 41 (4): 20–21. Archived from the original (PDF) on August 20, 2010. ^ American Association of State Highway and Transportation Officials (2006). "Image Gallery". The Interstate is 50. American Association of State Highway and Transportation Officials. Archived from the original on February 25, 2012. Retrieved February 22, 2012. ^ American Association of State Highway Officials (1958). Manual for Signing and Pavement Marking of the National System of Interstate and Defense Highways. Washington, DC: American Association of State Highway Officials. OCLC 3332302. ^ National Joint Committee on Uniform Traffic Control Devices; American Association of State Highway Officials (1961). "Part 1: Signs" (PDF). Manual on Uniform Traffic Control Devices for Streets and Highways (1961 ed.). Washington, DC: Bureau of Public Roads. pp. 79–80. OCLC 35841771. Retrieved February 22, 2012. ^ National Joint Committee on Uniform Traffic Control Devices; American Association of State Highway Officials (1971). "Chapter 2D. Guide Signs: Conventional Roads" (PDF). Manual on Uniform Traffic Control Devices for Streets and Highways (1971 ed.). Washington, DC: Federal Highway Administration. p. 88. OCLC 221570. Retrieved February 22, 2012. ^ National Advisory Committee on Uniform Traffic Control Devices (1978). "Chapter 2D. Guide Signs: Conventional Roads" (PDF). Manual on Uniform Traffic Control Devices for Streets and Highways (1978 ed.). Washington, DC: Federal Highway Administration. p. 2D-5. OCLC 23043094. Retrieved February 22, 2012. ^ Zhang, Sarah (October 7, 2014). "An Arizona Highway Has Used the Metric System Since the 80s". Gizmodo. Retrieved February 25, 2019. ^ Office of Highway Policy Information (July 27, 2010). Most Travelled Urban Highways Average Annual Daily Traffic (AADT) > 250,000 (Report). 2008 Highway Performance Monitoring System (HPMS). Federal Highway Administration. Retrieved May 9, 2012. ^ a b American Association of State Highway and Transportation Officials (n.d.). "Interstate Highway Fact Sheet" (PDF). American Association of State Highway and Transportation Officials. Archived from the original (PDF) on October 10, 2008. Retrieved February 22, 2012. ^ Hall, Jerry & Hall, Loretta (July 1, 2009). "The Adobe Tower: Interesting Items about the Interstate System". Westernite. Western District of the Institute of Transportation Engineers. Archived from the original on September 28, 2013. Retrieved July 23, 2013. ^ a b c d Obenberger, Jon & DeSimone, Tony (April 7, 2011). "Interstate System Facts". Route Log and Finder List. Federal Highway Administration. Retrieved February 22, 2012. ^ a b Federal Highway Administration (April 6, 2011). "Miscellaneous Interstate System Facts". Federal Highway Administration. Retrieved February 22, 2012. ^ "FHWA Route Log and Finder List". Federal Highway Administration. January 31, 2018. Retrieved August 25, 2018. ^ Transportation Planning and Programming Division (n.d.). "Interstate Highway No. 10". Highway Designation Files. Texas Department of Transportation. Retrieved August 31, 2010. ^ DeSimone, Tony (October 31, 2002). "Table 1: Main Routes of the Dwight D. Eisenhower National System Of Interstate and Defense Highways as of October 31, 2002". Route Log and Finder List. Federal Highway Administration. Retrieved September 13, 2009. ^ "Table 3: Interstate Routes in Each of the 50 States, District of Columbia, and Puerto Rico". Route Log and Finder List. Federal Highway Administration. Retrieved August 25, 2018. McNichol, Dan (2006). The Roads That Built America: The Incredible Story of the U.S. Interstate System. New York: Sterling. ISBN 978-1-4027-3468-7. Rose, Mark H. (1990). Interstate: Express Highway Politics 1939–1989. Knoxville: University of Tennessee Press. ISBN 978-0-87049-671-4. Schwantes, Carlos Arnaldo (2003). Going Places: Transportation Redefines the Twentieth-Century West. Bloomington: Indiana University Press. pp. 152–3. ISBN 9780253342027. Blas, Elisheva (2010). "The Dwight D. Eisenhower National System of Interstate and Defense Highways: The Road to Success?" (PDF). History Teacher. 44 (1): 127–142. Browning, Edgar A (2011). Roadbuilding Construction Equipment at Work: Building the Interstate Highways through New England's Green Mountains. Icongrafix. ISBN 978-1-58388-277-1. Friedlaender, Ann Fetter (1965). The Interstate Highway System. A Study in Public Investment. Amsterdam: North-Holland Publishing. OCLC 498010. Hanlon, Martin D. (1997). You Can Get There from Here: How the Interstate Highways Transformed America. New York: Basingstoke. ISBN 978-0-312-12909-5. Lewis, Tom (1997). Divided Highways: Building the Interstate Highways, Transforming American Life. New York: Viking. ISBN 978-0-670-86627-4. Lichter, Daniel T.; Fuguitt, Glenn V. (December 1980). "Demographic Response to Transportation Innovation: The Case of the Interstate Highway". Social Forces. 59 (2): 492–512. doi:10.1093/sf/59.2.492. JSTOR 2578033. Wikimedia Commons has media related to Interstate Highway System.